Agios Nikolaos, the capital of the prefecture of Lassithi, is a picturesque and popular resort town on the bay of Mirabelo with a harbour area pulsating with activity and restaurants and cafes providing a cosmopolitan atmosphere, though the town itself has maintained its traditional style. Agios Nikolaos is easily reached in an hour (65km) from Heraklion, 1 1/2 hours from Sitia (70km), and 45 minutes from Ierapetra (36km). There is no airport, although Heraklion airport is less then one hour away. There are boats to Piraeus (Athens) and to Rhodes during the summer. The islands of the Cyclades are accessible from Agios Nikolaos, as are Kasos, Karpathos, and Kos of the Dodecanese. 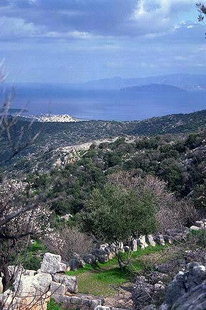 The municipality of Agios Nikolaos organizes "Lato" during the tourist season. This festival consists of a number of music and dance groups including ethnic and foreign, folkloric, and modern. There are also theatrical performances and water sports competitions. In addition, every two years, during Naval Week in July, special events are organized. All types of tourist facilities may be found in Agios Nikolaos. Since it is a very popular resort, there may be some difficulty finding accommodation. The National Tourist Office (EOT) is very helpful and is found on the main street, on the west side of the bridge at the harbour. 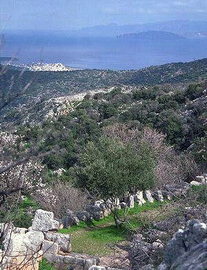 Tours may be arranged in Agios Nikolaos to Spinalonga Islet, to Lassithi Plateau, the town of Kritsa and its Byzantine churches. The best beaches are on the east side of the town, in the small protected bays, and may be reached by local bus service. Ask for details at the Tourist Office. 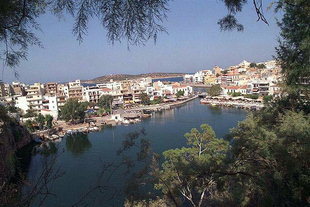 Agios Nikolaos is the most touristically developed town in Crete. The area has a great deal to offer to everyone. The history of Agios Nikolaos begins in ancient times when it was the port for Lato, a powerful city during Hellenistic times. 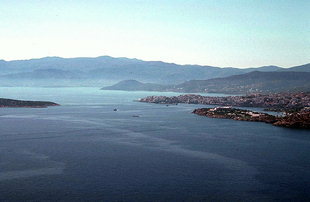 The harbour was still used during Roman times and the first Byzantine period although its importance had diminished. After this, it disappeared from history only to reappear in 1206 when the Genoans built the fortress of Mirabelo and gave its name to the town and bay. An earthquake destroyed the fortress and no trace of it remains. In the sixteenth century, the Venetians gave the town its current name, taken from the chapel of Agios Nikolaos on the peninsula of Limena. During the Turks' rule the town was uninhabited and only after 1870 did people move here, mainly to escape from Turkish persecution.